That’s what happens when the oppressive heat has sucked what little will you should have to put on pants to go to the store for a handful of things that would make dinner look less… scavenge-y. But it’s seventh-circle-of-hell hot. And you’re the genius who bought the black car with the black leather interior in Houston. Just “garbage pizza,” as Jason refers to it. Although I object to the name – I dare him to find garbage that tastes this good. Barbecue sauce, brie, and bacon - these random leftovers come together for a fantastic pizza. Preheat your oven to 550. Stretch your pizza dough into a large round on a lightly floured and cornmealed surface (you can read more about that here). Brush the edges of the dough with olive oil. 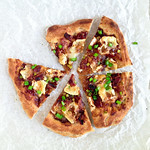 Top with barbecue sauce, white and light green onions, small chunks of brie, and crumble the bacon over top. Switch your oven to broil and transfer the pizza to the oven to cook (on a pan or stone) until the crust is browned and the toppings are bubbly and starting to brown. Remove from the oven, top with the dark green onions, and serve. This pizza looks incredible! Love the combination of flavors. I definitely need to try this! I would HAPPILY eat a slice of your “garbage”! This looks amazing! Soooo in love with this! And we made a heat-induced “garbage” pizza this week as well… bacon, chiles, and smoked mozzarella! I can taste these right now! Mmmmm. Swell job. Never thought of using brie on a pizza, but it sounds delicious! Officially drooling! How do you not gain a thousand pounds by eating all this deliciousness???? Brie on a savory pizza?! I love it! What a cute post & great recipe idea! Thanks! Brie on pizza sounds amazing! I’m hoping the weather cools down soon. I made this for dinner but with goat cheese in place of the Brie – it was SO good…a great combination! Thanks for the inspiration! This is exactly what I do but when it is winter here. There is no way I’m going outside if it is 10 degrees outside. What a great combo! LOVE this topping combo! Lots of my favorite things! I tried this and it was fabulous! Thanks for the this recipe. Garbage pizza? If only all garbage looked so lovely! How did the delicateness of the brie stand up to the BBQ sauce? They’re just two ingredients I wouldn’t have imagined putting together. And now I am oh so curious! This is possibly my favorite recipe ever. This is sooooo my life. I feel like my green onions are ALWAYS sketchy, even when I use them quickly. Hoping you all get some reprieve from the heat soon, but at the same time, pants are overrated.